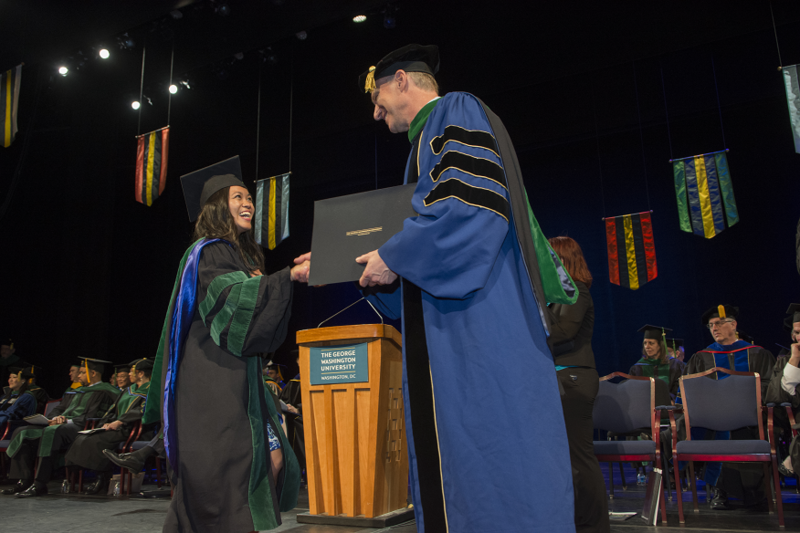 In the story of higher education and professional careers, the chapter on medical school — one of hard work, endurance, and excellence — came to a close on Sunday, May 15, at the MD graduation. GW School of Medicine and Health Sciences (SMHS) fourth-year medical students needed to make just one edit. “Remember, it’s not MSIV, it’s MD, for the first time,” said W. Scott Schroth, MD, MPH ’90, associate dean for administration and associate professor of medicine at SMHS, as he instructed graduates on how to sign the GW registry. As the students prepared to ascend the stage to receive their hoods and scrawl their signatures into the book, the Class of 2016 — whose members received awards on Friday, May 13, at the annual Medical Student Gala — was reminded of the importance of their own stories and those of their patients. “Here’s what I’ve learned: there’s a place for dispassion in the science of medicine, and there’s a place for passion in the art of caring,” said keynote speaker Jonathan B. Perlin, MD, PhD, MSHA, MACP, FACMI, president of clinical services and chief medical officer of the Hospital Corporation of America. Perlin, who detailed the importance of narrative in the practice of medicine, is the son of prominent members of the GW community, Seymour Perlin, M.D., Emeritus Professor of Psychiatry and Behavioral Sciences at SMHS, and Ruth Perlin, a member of the GW Museum Board of Directors; together, Seymour and Ruth Perlin serve on the Friends of Luther Brady Gallery Board. Jeffrey S. Akman, MD ’81, RESD ’85, vice president for health affairs, Walter A. Bloedorn Professor of Administrative Medicine, and dean of SMHS, who presented his annual charge to the graduates, also urged them to think of their patients, particularly when social or financial forces could potentially turn them away. That courage is one of several attributes — service, altruism, integrity — that SMHS students have learned to embody as they turn the page on their time in medical school. Ramos, who earned the Pediatric Departmental Award for Excellence in Care, Advocacy, Research, and Education, is also one of four Adopt-a-Doc scholarship recipients graduating this year. The scholarship, provided by a GW alumni or friend of the school, made her feel more supported, she said, both financially and emotionally, and allowed her to pursue what she’s passionate about: pediatrics. She also felt inspired to incorporate teaching and mentorship in the future, among other goals. Before they could start the next chapter — residency — the students completed their walk across the stage to rounds of applause.